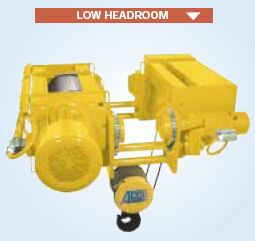 Wright ACCO® HEAVY-RATED™ wire rope hoists and crane components are built with modular construction. need. HEAVY-RATED™ hoists and components can be fitted to many varied and diverse applications. 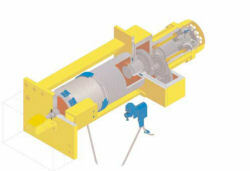 The hoist motor is a squirrel cage design incorporating a D.C. rectified electromagnetic brake and plug-type connection. It is designed for continuous service with high duty factors and cycles. The standard motor has two speeds with a 6:1 speed ratio. The standard voltage is 460-3-60. An optional closed-loop inverter control is available. Class H insulation is standard. Brakes are electromagnetic discs with flat-faced linings. The friction linings are long lasting and the brake is easy to maintain. The drum is constructed from a seamless steel tube with machined grooves. The drum has self-lubricating, commercial bearings. The drive from the gearbox to the drum is via a direct splined shaft. The rope guide is manufactured from nodular cast iron with self-lubricating graphite. Rope guide is formed by two pieces, which can easily be assembled without special tools. Pendants are manufactured from high impact polypropylene and provide double insulation. Push buttons are color coded with internationally recognized symbols to indicate function. Lightweight and ergonomically styled housing reduces operator fatigue. A plug-type NEMA 4/12 pendant with an E-stop button is supplied as standard with all hoists. 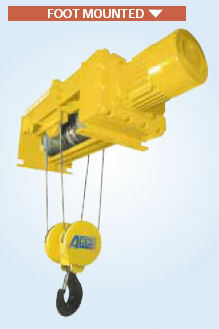 All hoists have an electromechanical load cell as standard. The overload device must be set in the field with a certified load. A metal NEMA 4/12 enclosure is located on the hoist frame allowing easy access to the electrical control components and is supplied with plug-type interconnections. Motor circuit breakers are standard for hoist and trolley motors. A three-element geared limit switch is standard on all hoists. The switch limits hook movement in the up and down motions (shown). 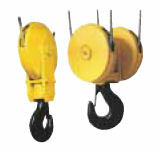 All hoists are supplied with a gravity type upper hook travel limit switc (not shown). 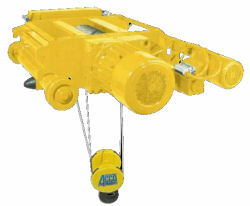 Single line hoists will not be supplied with a gravity limit switch as standard. The gearbox is rugged and compact. Gears have precision cut helical teeth. The drive from the motor to the gearbox is direct with no coupling devices. All of the gears are lubricated by an oil bath in the interior of a closed casing. The trolley motor is a squirrel cage design incorporating a D.C. rectified electromagnetic brake and plug-type connection. The standard trolley speed is 80/20 FPM two speed. Optional speeds are available, either with 4:1 two speed or inverter control. The standard voltage is 460-3-60. Low torque, high inertia drives provide gradual acceleration and smooth deceleration without excessive load swing. The drive to the wheel is via a direct splined shaft. The load block houses steel sheaves with a rotating hook and latch. 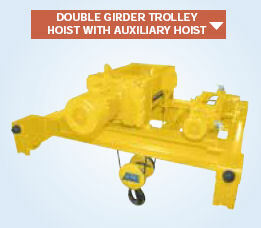 Monorail trolleys are adjustable or a 4” to 20” flange width.